Due to excessive tax and other rising overheads plus the impact of the very weak pound it is no longer viable to operate our wonderful award-winning holiday cottage here in central France. We are of course very disappointed, but we are forced into making this decision after a careful analysis of our every rising costs. The introduction of yet another new tax on guests from January 2019 was the straw the broke the camels back! In addition, BREXIT uncertainty has reduced advance reservations by over 90% compared to past years and we cannot see any light at the end of the tunnel until BREXIT is settled one way or another. We would love to see friends and past guests, please contract Maureen direct via email or phone, see CONTACT US for details. 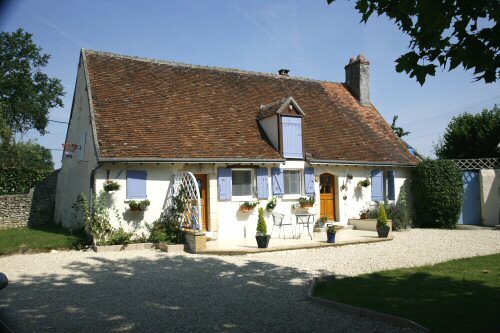 Our lovely Brenne cottage retains all the charm of the old historic building but with all the quality comforts you would expect to ensure the visitor has a relaxing and stress free holiday. If you are looking for a very well appointed cottage in a country location with ample grounds to relax then this is the place for you. Celebrate booking with a nice glass of wine!